Jalen Brunson of Villanova takes the ball to the rim against Marquette in Big East quarterfinal game. 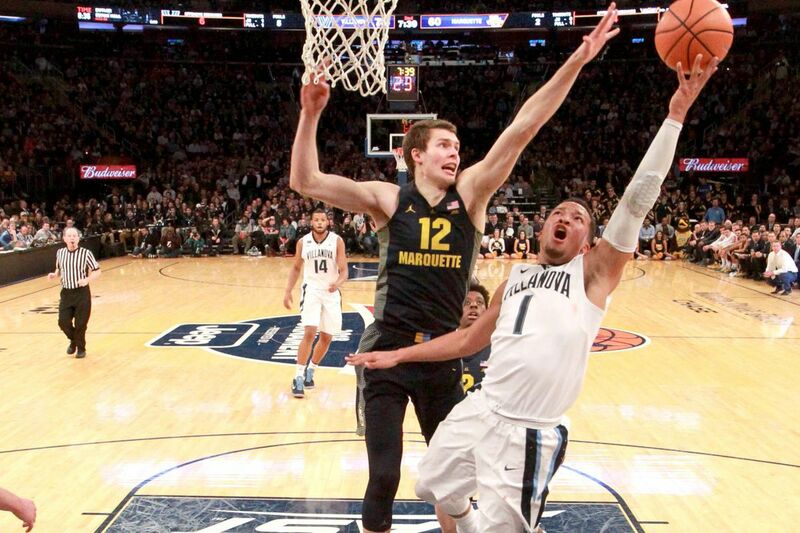 NEW YORK – Midway through the first half of Thursday night's Big East quarterfinal against Marquette, Villanova coach Jay Wright needed to deliver a difficult set of instructions to the Wildcats during a timeout. The reason behind the instruction wasn't difficult to understand. Villanova had hoisted up 10 three-point shots, made just two of them and, despite holding a two-point lead in the game, it was an ugly 12-10 lead and his team just didn't look settled. Jalen Brunson of Villanova shoots a 3-pointer against Marquette during the 2nd half in the Big East Tournament at Madison Square Garden on March 8, 2018. "That's why you fear saying it because they're so good, they listen," Wright said. "Sometimes with good kids like that, you tell them that and then they drive it all the time, and it goes the other way. That's why when you have veterans like Jalen (Brunson) and Mikal (Bridges), they know how to mix it up." Apparently, things didn't get too out of whack. Villanova pulled away in the second half to an easy 94-70 win that advances the Wildcats to the semifinal round of the tournament for the 20th time in program history. There was plenty of history to go around, as there always is in Madison Square Garden. Wright recorded his 414th win at Villanova to pass Al Severance on the school's all-time coaching list. And the Wildcats advanced toward another date with their own Big East and NCAA tournament history, the annual passion play that takes place in March, and sometimes April. "I'm most proud to be the coach of Villanova, honestly. The wins and everything don't matter. I know I'll look back on it later," Wright said. "I'm really excited that we're starting to get better defensively. That's really what's in the front of my mind right now." The defense was good throughout – although shutting down Marquette's deep-shooting guard tandem of Markus Howard and Andrew Rousey wasn't entirely possible – but what concerned Wright in the first half was how to tinker with the offense without taking away its aggressiveness. "It's a delicate balance and with tightly wired athletes, it's a difficult subject to broach," Wright said. "That's why we say, 'Shoot 'em up and sleep in the streets,' because we always like them to be more on the aggressive side of shooting the ball, but then you've got to be intelligent about it and mix it up some." Wright's fears were partly realized, as the Villanova absorbed his message and didn't attempt another three-point shot for the next 10 possessions, a span of five minutes during which they methodically got the ball to the inside. Not that it was bad. In fact, with Marquette coming off a game the night before, banging up against the Eagles wasn't bad strategy. Villanova coach Jay Wright became the winningest coach in school history with the Wildcats’ victory over Marquette in the Big East tournament at Madison Square Garden on March 8, 2018. The scoreboard didn't necessarily agree, though. Howard and Rousey were dropping in three-pointers while the Wildcats were playing for two, and Villanova was trailing by two points, 23-21, when Eric Paschall grabbed an offensive rebound on a missed free throw and kicked the ball to Donte DiVincenzo for a wide-open three-pointer. Donte DiVincenzo of Villanova shoots a 3-pointer over Sam Hauser of Marquette during the 2nd half in the Big East Tournament at Madison Square Garden on March 8, 2018. Not only did the Wildcats never trail again after DiVincenzo buried that shot, they never stopped shooting three-pointers again, either. After missing eight of their first 10 in the game, the Wildcats made 13 of their next 19 and turned the game into a rout. "Even if you miss them, if you're open, keep shooting the ball," Bridges said. "We all have confidence in ourselves and missing shots doesn't really affect us." That didn't mean they didn't listen to Wright. They did, and drove from the perimeter exclusively for quite a while, particularly by their standards. It is a facet of their game that will come in handy at some point of tournament season when the three-pointers are more stubborn. That was Wright's message on this night. "Exactly. (Marquette) looked loose and comfortable and we didn't look loose and comfortable," Wright said. "We just said, 'Let's get some movement. Let's try to get to the rim, and try to get some easy baskets.'" There are no easy baskets in March, of course, and it will take all their weapons, both short-range and long, for the Wildcats to make a significant run. Thursday night was a good reminder that the offense has to be balanced, even if that is sometimes a difficult balancing act for both the coach and the players.